I have had a few comments that the red twirl on egg looks like ketchup. No, it is actually Sriracha Hot Chilli Sauce. Quite a difference! In January 2012, I experienced the joy of having surgery which, in spite of opting for the ‘keyhole’ method, took a good two to three weeks or so to heal. I distinctly remember asking the surgeon a good few days afterwards why it still hurt so much, to which he replied : “What do you expect? I did stab you three times.” I guess sometimes the ‘obvious’ is never ‘obvious’. All I craved for following surgery was Japanese Ramen soup. I ordered the Wagamama Cookbook, then ended up buying a whole host of Japanese ingredients online which, I’ll admit were a little unusual to me at the time… and then began my love affair with cooking Japanese food. I worked my way through the book, and tried pretty much every soup dish going. The taste was fresh, the ingredients had texture, most dishes were easy to prepare and, I am led to believe good for me too. In the last few months, I had sadly forgotten my affection for Ramen soup and had a rummage to find just about the perfect ingredients to make a dish work. It is amazing how many Japanese ingredients I still had loitering in my cupboards – Dashi No Moto, Sriracha Hot Chilli Sauce, dried Shiitake mushrooms and of course Ramen noodles and a few other odds and sods… like a steak which was screaming out to me to be eaten. What I really like about many Japanese recipes (or at least, the recipes I have chosen to make – I am not at all trying to trivialize the great skill and talent required to make some stunning dishes out there) are that they require very few ingredients, portions of the meal can be prepared in advance, and assembling the dish and getting the final touches together is really quick. Oh, and the flavours truly rock, and the texture of some of the ingredients is perfect. If I want limp and stewed or boiled to death matter, I’d opt for some of the very worst pub grub which still amazingly exists out there. I digress. What makes this dish even quicker (and it is a bit of a cheat, I know) is to use Dashi No Moto for the broth, rather than making it from scratch. Dashi, if interested, is, according to wikipedia: a class of soup and cooking stock used in Japanese cuisines. Dashi forms the base for miso soup, clear broth, noodle broth, and many kinds of simmering liquid. I am not being bone-idle – based on my location (a small village on the outskirts of Wakefield) there are some ingredients much harder to find than others. I will certainly have a go at making my own Dashi when the opportunity presents itself. This Chilli Beef Ramen recipe, like most of what I do is an adaptation of two or three other recipes I have tried, and coming up with this. On a final note – all ingredients I have used can be found online, or if you are lucky enough, have an oriental store or market where you live which is stocked to the hilt with truly amazing ingredients. The Chilli Beef Ramen soup is as good, or if not better than anything I have for a meal out. The current recipe will make a very generous helping for one- if you want to make for more than one, simply double up on the ingredients. 1 x trimmed 220g sirloin, rib-eye, or rump steak cut into thin diagonal slices, cutting against the grain. 4 x dried shiitake mushrooms, rehydrated. First, combine the grated garlic, honey, olive oil, soy sauce and Worcester sauce and mix thoroughly. Then, add the beef strips, cover with the marinade for 20mins to 1 hour, and cover with cling film. Next, place the dried mushrooms in a small bowl or ramekin, and cover with warm water. Leave for around 20 minutes until re-hydrated, then drain and carefully squeeze out any excess water. You can optionally preserve some of the mushroom flavoured water and add it to the broth. Meanwhile, hard boil the eggs, and once cooked, plunge in cold water to cool. Carefully shell the eggs,and set aside. Next, add the Ramen noodles to a pan on lightly salted water and cook until al dente. It is better to slightly under-cook them as you'll be adding hot broth to them and they'll continue to heat through.Once cooked, sieve, and rinse in cold water to get rid of any starch. Once cooled, place the Ramen noodles on the bottom of the Ramen soup bowl, and spread them out evenly. Give the pan a quick rinse. Then, add the 3 cups of boiling water into the pan, and stir in the Dashi powder. reduce to a simmer, and add the tbsp soy sauce. Bring a small frying pan to a medium-to-high heat, and drain the marinade (containing the olive oil) into it. As it starts to bubble, swirl it around so the base of the pan so that the bottom is evenly lubricated, and add the marinated beef. stir-fry for 3-4 minutes until cooked to your liking. Now, the rapid assembly begins. Carefully place the beef strips in one corner, the shiitake mushrooms in another, then, lay down the pak choi leaves.In the final corner, sprinkle the sliced spring onions. Then, ladle the broth over the pak choi (the leaves will wilt immediately), then cover the other ingredients. 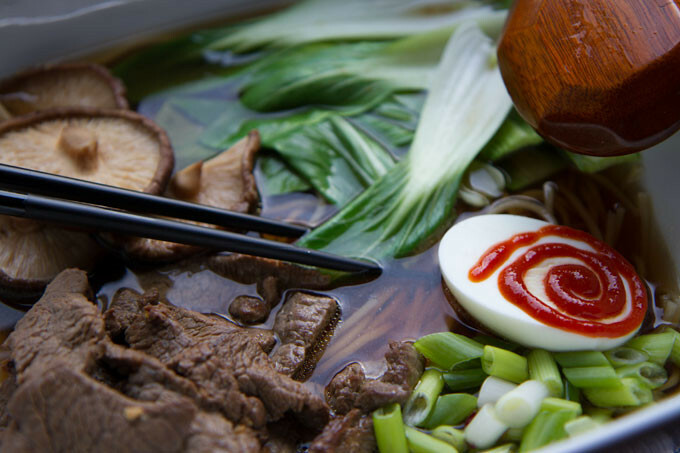 Finally, place half a boiled egg into the broth and decorate with a twirl of Sriracha hot chilli sauce. For those who like their Ramen spicy, give a good old squirt and stir through. If you have time, take out the steak from the fridge a good hour or so before using. Also, why not hard boil a couple more eggs than you need for this recipe as I am sure they can come in handy alter for a salad or snack over the course of a week? Finally, I am all for minimizing washing-up wherever possible. Rather than using 3 x pans, I used the same for boiling eggs, cooking noodles, and then bringing the broth to the boil. All it takes is a rinse between, and you are there.